Only a few cases of fraud and corruption are ever brought to light or reported, and even fewer are brought to justice. Journalism and mass media can be a powerful tool that can help shed light on and raise awareness around corruption cases, indirectly applying pressure on public authorities and ultimately contributing to the prevention and fight against corruption. 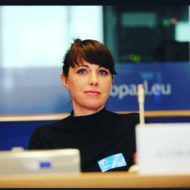 There are many other actors in the anti-corruption field, such as policy makers, technology experts, NGOs and researchers but there is currently no one formal platform or network bringing all these various actors together – resulting in many different organisations or actors working on similar projects which leads to a waste of resources and a lack of peer-to-peer learning. The database currently consists of media articles from free online media outlets in the Czech Republic, Hungary, Ireland, the Netherlands, Latvia, Lithuania, Romania, Slovenia and the United Kingdom. 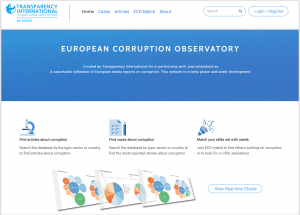 The database allows users to monitor articles with a clear link to corruption in Europe (whether there is an allegation of corruption, an investigation, or a court case). The website provides links to the original media sources for all the articles, together with a one line introduction in English. The European Corruption Observatory was created in 2016 by Transparency International EU in partnership with Journalismfund.eu. The project is funded by the European Commission. As part of this project a number of workshop were held with journalists and civil society to both discuss the potential for collaboration and to help inform the design of the database. On July 14 2016 a final conference on “The Role of Investigative Journalism and a Free Media in Fighting Corruption” was held in Brussels, Belgium. A final report “The European Corruption Observatory: Investigating Corruption” was presented.